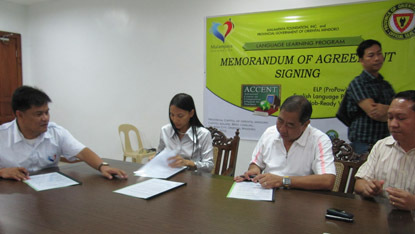 SPEECH-ACCENT or the special language enhancement training course sponsored by the provincial government of Oriental Mindoro and the Malampaya Foundation, Inc. (MFI) has been extended for another year after the signing of a memorandum of agreement (MOA) between the two parties last May 15, 2012 in Calapan City. Karen Agabin is being briefed by Olive Palomaria inside the ACCENT language laboratory at the provincial capitol in Calapan City. Oriental Mindoro Governor Alfonso V. Umali, Jr. and MFI Executive Director Karen H. Agabin were at the signing ceremony, which also highlighted the launching of the second round of the scholarship programme for Mindoro youths known as the Pangkabuhayang Dalubhasaan ng Bayan (PANDAYAN) Bridging Employment through Skills Training (BEST). SPEECH-ACCENT is a course designed to enhance the English proficiency skills of high school and elementary teachers and other government workers. Under the programme, MFI will shoulder the training fees of 200 participants while the provincial government will manage the project and undertake the recruitment, screening and final selection of qualified trainees. PANDAYAN BEST, on the other hand, is designed to develop the skills of the youth by employing a dual training system that combines the training centre and company in a single area. For this project, the provincial government will provide financial assistance for every trainee, while MFI will donate additional stipends per year. Applications for this scholarship will be open next month to underprivileged youths. 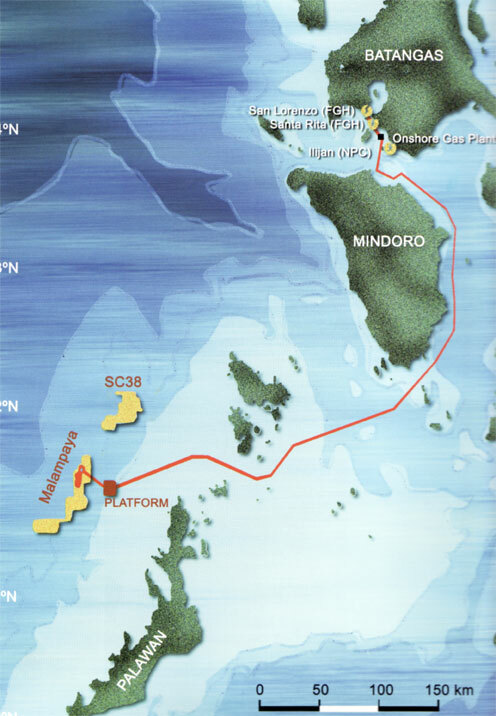 At the signing ceremony, Agabin reiterated Malampaya’s thrust of implementing a sustainable development project that complements the province’s learning and investment program thru fruitful partnerships between the government and entities like MFI. Governor Umali, for his part, underscored the importance of the joint undertaking and assured MFI of their continuous support for all its educational and livelihood initiatives in the province. Oriental Mindoro Gov. Alfonso V. Umali, Jr. (second from right) and MFI Executive Director Karen H. Agabin sign the memorandum of agreement between the provincial government of Oriental Mindoro and MFI that extends for another year the language proficiency course given to teachers and government workers. Other signatories are Teddy Bolivar, program manager of MFI (extreme left) and Provincial Administrator Angel Saulong; (right photo) Gov. Umali receives a plaque of appreciation from Karen Agabin.